There have been plenty of rumors that popular Chinese smartphone manufacturer Xiaomi would be branching out into manufacturing tablets, and now the company has delivered. Xiaomi CEO and co-founder Lei Jun took to the stage at an event in Beijing today to unveil the Mi Pad. The device is 7.9-inches, available in six colors, and it looks very much like an Apple iPad. The Mi Pad sports a 2048 x 1536 screen — from Sharp and Youda — and is powered by a 2.2 Ghz Tegra K1 processor, making it the first tablet to use the Nvidia processor. The device includes 2GB RAM, a 16GB ROM, and will support up to 128GB via a memory expansion card. It is equipped with an eight-megapixel camera on the back and a five-megapixel camera on the front. 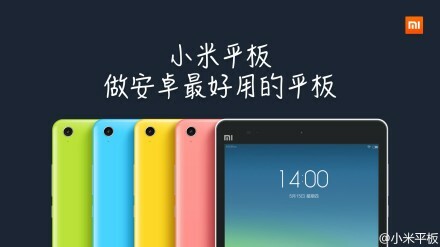 The Mi Pad will be retailing from 1499 yuan ($240) for a Wifi-only 16 GB version, while the 64GB is 1699 yuan (around $273). Xiaomi did not mention a cellular (or 4G) version of the tablet, and neither did the company confirm a hard launch date for the device. The company will begin ‘open testing’ of the device in June, as it has done with other hardware products. That essentially means that it will make a beta version of the device available for sale. Initial customer feedback will help shape a full launch for the product, although Lei Jun did not specify when that might be. Lei Jun told the audience of reporters that tablets are not easy to make, and that Xiaomi has spent as long as four years planning its first entry into the space. He claims that the Mi Pad has specs that will be equivalent to the best PC gaming experience, which gives an interesting insight into its design and development. Much of Lei Jun’s speech before the unveiling was about Apple and the iPad, and it seems clear that Xiaomi considers the US firm to be the gold standard for tablets. “We hope to put pressure on Apple,” Lei Jun said — statements of intent don’t come any clearer than that. Xiaomi already laid the foundation for its tablet when it tweaked its highly-customizable MIUI firmware, which is based on Android, with a new interface design to better suit a tablet — and brought it to Google’s second-generation Nexus 7 tablet, fir the WiFi version. The company previously said its engineers did a lot of new development and optimization to ensure the MIUI firmware is ideally re-adapted to a tablet, instead of just copying over MIUI as it is on smartphones. They applied a whole new design language to showcase content on the tablet, came up with new animation effects and re-designed the system for apps to show up perfectly so no matter whether the tablet is horizontal or vertical. In July last year, Google announced 70 million Android tablet activations and said that one in every two tablets sold globally was Android. That figure could be even higher now. It is little wonder that Xiaomi, as it fights to take its position among the most well-known Android smartphone manufacturers, would also want a slice of that pie. 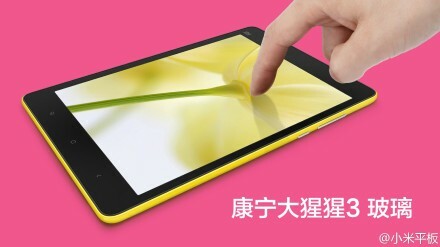 Note: An initial version of this post referred to the tablet as the Mi Tablet, but it is in fact called the Mi Pad. Apologies for the confusion with our translation from Chinese to English.